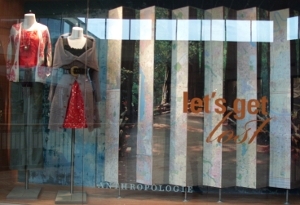 Anthropologie's simple display 'lets get lost' is an understated but professionally executed window. The vertical maps featured set the scene and also allow light to flow into the store. Some clever and original displays inside the store await, including an eclectic home office trees and glittery snow displays. 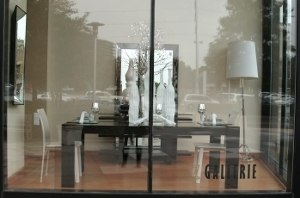 Pretty decorations are the highlight of Gallerie's tasteful holiday merchandising but with this window we found a Christmas display for the minimalist. There were also lots of colourful displays and even some glittery decorations for those that like their bling too! How could we pass this winter wonderland at Sephora? The transluscent sparkling layers introduce 'Holiday Magic' in these windows. 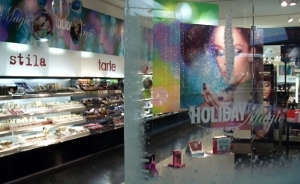 Then the eye is drawn to the alluring 'magic dust queen' graphics that provide a striking backwall to this beauty store. An enchanting environment!